I’m up on my soap box—pretend it is a soap box—because today has been declared International Box Day by the powers that be. Today is also Friday, which means it’s a Foto Frenzy time. After checking out the fotos chosen by you, the readers, there was nary a box to be seen. That means we’ll have to cheat pick some numbers and see what comes up. Nevertheless, they are unedited except to add the watermark. I’ll admit that while I will play in boxes, I’m standing on top of the box in the majority of box fotos. Lately, I hardly look at a box. I know that when a box comes into the condo, the flashy box comes out of hiding. TW can’t wait; she wants my reaction the moment she opens the box cos the contents is usually for me. Sorry Woman, it ain’t happening. I couldn’t care less what’s in the box as long as you’re taking aim at me. At the beginning of last year, I won a Pet Box during a Blogpaws’ Chat. I never received the first box they sent cos someone at the front desk stoled it so they had to send another. I didn’t really like anything in the box but everyone told me how much fun those boxes were to lay in. I thought it was a little small so I sat in it while TW snapped #3857. I find the box from a case of water is just the right size. I’ll even get in there while the plastic is on or if there are a few bottles still in it. In #1885 I have red demon eyes but I can assure you I am 100% comfy even if it’s next to the sucky thing. I look forward to seeing all your Box Day fotos. 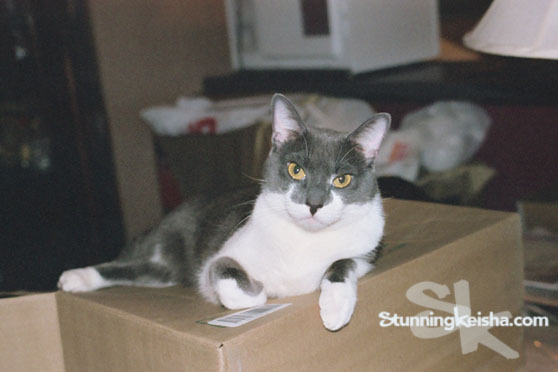 I have more Box Day fotos to show you at the Tabby Cat Club so stop by and let me know you visited. That post will be live around 5 a.m. I'm not a box lover, although Boodie seems to be quite fond of them! I LOVE that first photo of you - though you do look like you have had about enough of the flashy box in your face. Great Box Day post CK!!! CK you always look stunning (seriously)!!! You sure don't need any photoshopping in your photos. You're just fantastic. Oooo.... *swoons over water bottle box WITH plastic still attached* Leave it to you, SK, to have the best box ever! Happy International Box Day! 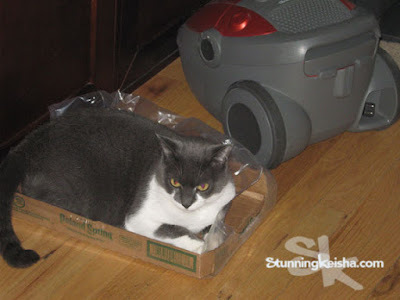 CK you look so cute in your boxes! You look beautiful in any size box. Happy Box Day! 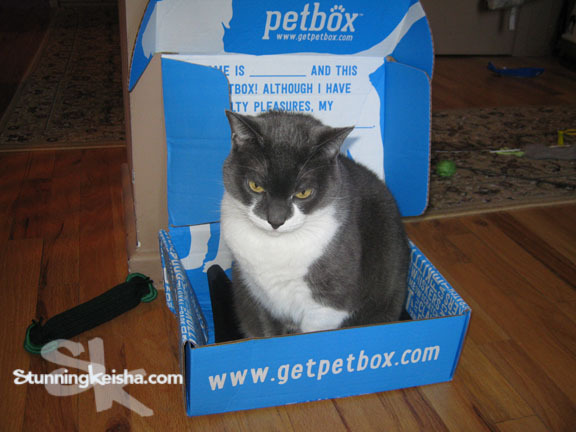 That first photo of you, Keisha, is quite fetching :-) Hey, our Duchess does not "do" boxes. She won't even sit on top of one. The rest of us, some like in the box, some like on the box, some like paper that will crinkle in the box, some like Walmart bags in the box...hey, we love how everyone is different. How boring it would be otherwise, huh? Aw, boxes are awesome, even if you have to endure the flashy box. Happy International Box Day! I like that earlyi picture of you. You were stunning then and still are. Meh... I don't really care about boxes but Mia really likes them! Happy International Box Day and Happy Friday! "The only thing I can tell you about this foto is that it’s OLD. "...Um, I think you're dating yourself, CK! If I'm in a box, I usually jump out when I see mom coming with the camera. It's what we are supposed to do , right? You love your boxes, CK. CK! All your box photos is great. And yous knows grrl furrend, yous not aged at all!